These materials relate to the Kansas Department of the Anti-Saloon League of America. Correspondence is primarily between State Superintendent W.J. Herwig and Reverend Milo G. Kelser, field manager at the Anti-Saloon League of America headquarters in Westerville, Ohio. 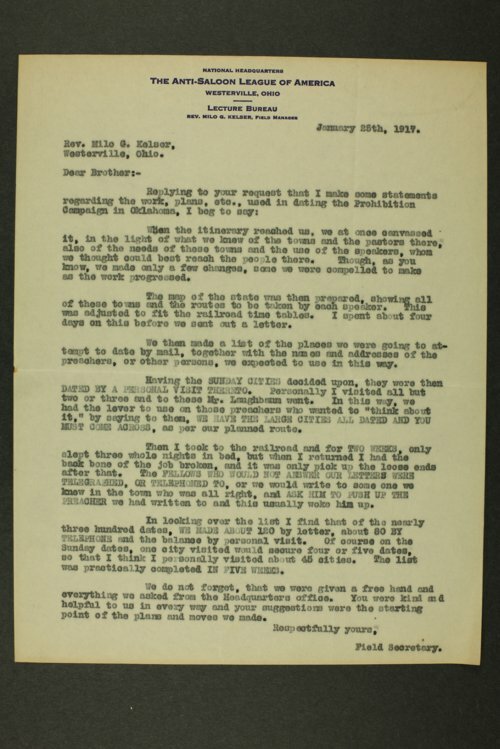 Correspondence is also exchanged with Reverend Julius Smith and Professor O. G. Markham of Baldwin City. Travel itineraries, legislation, and the effects of World War I are frequent topics of conversation. The group sought to organize prohibition meetings in conjunction with Sunday church services around the state. Monthly financial reports are also included.